Logograph hopes to be a fun, creative and educational application designed to let you to draw lines and shapes, not just on a flat piece of paper like traditional turtle graphics, but in 3D space and be able to rotate it all around in front of you. Update news! Logograph is now being re-written for Unity, so will be an iOS (iPhone and iPad), Android and PC/Mac/Linux app! 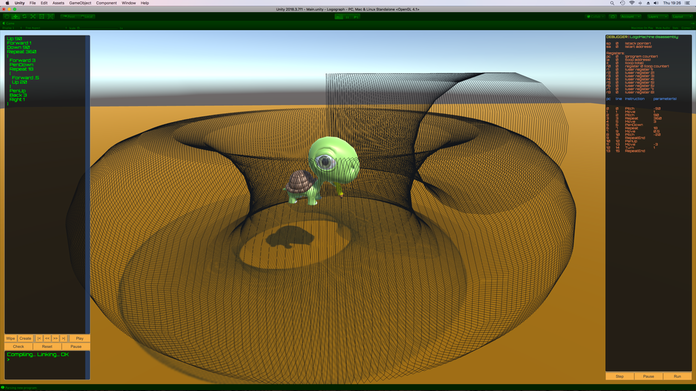 Here is a couple of early screenshots and videos showing the turtle in action. 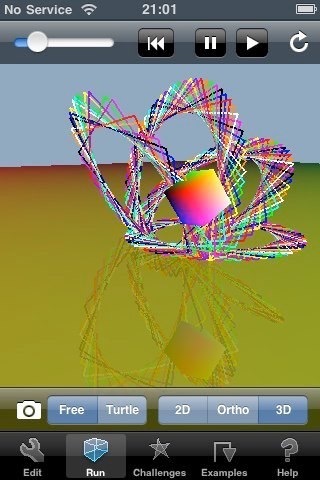 It now supports recursion (which means a procedure that calls itself) so fractals are now supported. The below info is from years ago, when it was still just an iPhone app in the making (and before the iPad was even announced!). Soon there will be a playable WebGL version right here on the website. Keep an eye on the Twitter feed twitter.com/DemonStudios for regular updates of the new version! 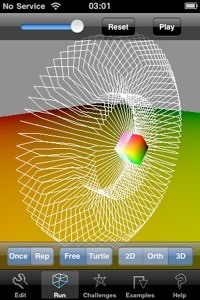 Those who are interested in programming, are fascinated by mathematical art, or simply have an obscure previously undiscovered interest in programming a big-headed flying robotic turtle with a magic marker in its mouth should enjoy this. 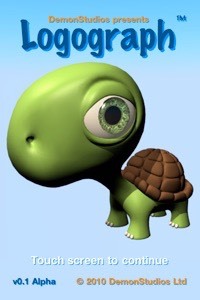 In Logograph you give a turtle (literally) a simple set of movement instructions (such as Forward 50, Up 45, Left 90, Right 5) and he smoothly obeys your command in the 3D world in which he resides. The game will have a full tutorial explaining in easy steps how to get the turtle to do what you want, and there will be a set of challenges for you to complete. The pictures are all in-development screenshots to give you an idea of what’s to come - it’s still only about 60% complete and most things are placeholder (e.g. the turtle in-game is still just a coloured cube!) but watch this space. Anyone already familiar with the Logo programming language will be right at home straight away, as it is based on it, but don’t worry you won’t need to be. You won’t even have to type code in, everything will be drag and drop in a clear and user-friendly visual interface (although I hope to include a full editor for advanced users). This should be a great App for use in schools to teach kids about computer programming (which is what Logo was invented for). 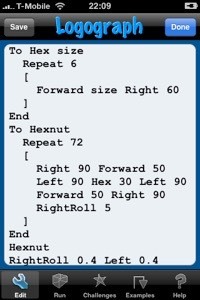 Here’s some good info and history on Logo: http://en.wikipedia.org/wiki/Logo_(programming_language). 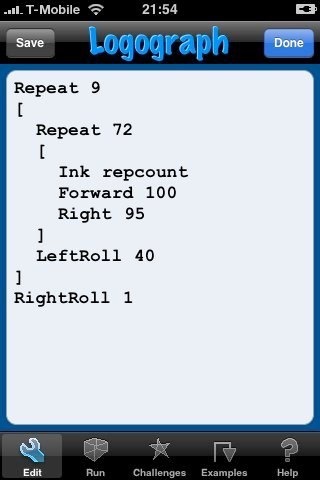 You can try classic 2D Logo on your computer here, which even works on the iPhone: http://www.calormen.com/Logo/. If you like that then you’ll love Logograph! Logograph is different from these in that it is an evolution of the basic Logo principles of the late 60s and brought right up to date with 3D movement, and not just lines but also being able to draw big solid polygons and having fast smooth animation.